Ready-to-use adhesive paste for fixing ceramic wall tiles on indoor gypsum-based or cement substrates in damp places. Particularly suitable for wooden substrates. - Fixing ceramic tiles of all types on indoor walls. - Suitable for use when high flexibility is required, such as: fixing on plasterboard or wood. 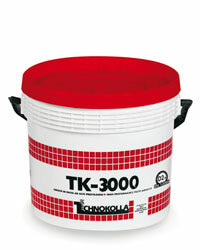 - Suitable for fixing in damp places, such as: communal shower facilities and bathrooms. Cement-based or gypsum-based plaster, plasterboard, wood, cement-lime mortar, concrete.